How is oil bought & sold on the world market? For example, I get the impression that an Exxon doesn’t simply buy oil directly from Saudi Arabia, but that instead, there are speculating middlemen who intercede along the way, and evidently are able themselves to affect the ultimate price to oil companies, and so, to consumers. Who are these middlemen in the oil transaction, how much impact do they exert on prices, and why do they have to exist in the first place (i.e., why can’t an Exxon simply “buy direct” from Saudi Arabia, and cut these speculators out of the deal altogether? Follow-up: if the daily quoted price (say, $95/bbl.) is for holdover/leftover oil, what is a normal price these days for the vast majority of oil bought & sold thru L-T contracts? If materially lower, how is it that we only ever hear about this marginal price? Smoke & mirrors at play here? The price of oil sold through long-term contracts tends to be lower than the spot price. 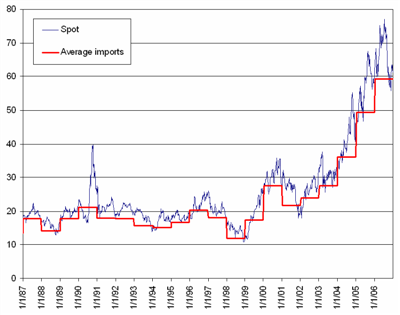 For example, in 2006, the average spot price was $66.25, while the average price of all oil imported into the U.S. was $59.18. A longer-term picture can be seen below. As to why you only hear about the spot price, it is simply because it is published daily. Average prices, in contrast, are published by the U.S. Department of Energy annually after the year-end. This entry was posted in Answers, Business, Economics. Bookmark the permalink.